How would you balance the city's books? Where would you spend; where would you save? With four months to go until we set next year's budget, we have launched a new online tool to help encourage as many residents as possible to have their say on where money should be invested and saved in 2015/16 and beyond. The budget planner, accompanied by a short explanatory film on our website, highlights the range of services the Council provides and the challenges we face over the coming years. The consultation period runs all the way through until Friday 19 December, and we will consider all feedback prior to setting the final 2015/16 Budget in February. Very much with the above challenges in mind, 12 months ago councillors instructed our Chief Executive, Sue Bruce, to consider how we can improve performance, productivity and customer satisfaction. In short, we don't have any choice; we must do things differently. Edinburgh is the fastest growing local authority area in Scotland and we are facing an ever increasing demand for our services against a backdrop of rising demand but stand-still or falling budgets. Having established an overall approach to change in the council, Sue has now set out her vision for the future. Her report describes how we will plan to change the way we deliver services by focusing on priorities and outcomes in the city's neighbourhoods. This will allow us to deliver best value services for residents, reflect local needs and work together as efficiently as possible. My coalition colleague and Deputy Lord Provost, Deidre Brock, recently hosted the official launch of the Edinburgh Befriending Consortium (EBC) here in the City Chambers. Made up of three organisations - CrossReach, The Broomhouse Centre and Children 1ST - the consortium provides much-needed support to young people who are affected by substance misuse in their family and who may be particularly isolated and unable to take part in activities. Thanks to funding from Lloyds TSB Foundation for Scotland, Partnership Drugs Initiative, the Edinburgh Alcohol and Drugs Partnership and the Council, EBC is now on a much firmer financial footing. If you are interested in becoming a volunteer, please visit the Children 1st website for further information. I am delighted to report that our parks, streets and gardens have been awarded Gold at the prestigious Entente Florale competition, Europe's biggest environmental awards. Following on from our success in Britain in Bloom, this is a huge accolade for Edinburgh and proof that we have some of the finest green spaces in Europe. It's also testament to the huge amount of work carried out by the Council and the many volunteers and partners across the city. We will receive a bronze plaque recognising these achievements, which will go on display later this year. Congratulations also to the Council's Communications service, which was named Outstanding In-House Public Relations Team at the CIPR Scotland PRide Awards held last week. The award recognises a diverse range of campaigns, aimed at both internal and external audiences. Judges cited a "superb team and a worthy winner", praising its consideration of a broad range of audiences through its campaigns. The Council also won silver for Scottish Public Sector Team of the Year, and was finalist in a further two categories - Best Public Sector Campaign and Best Use of Social Media. I have high hopes that the significant interest, and turnout, in the Referendum will translate into greater engagement with local politics - and we're already doing what we can to encourage this. Last month, we expanded our ability to broadcast council business, with the Dean of Guild meeting room now fitted out with cameras and microphones to stream nine additional committee meetings. This is a another step forward in ensuring transparency and raising awareness of how the democratic process works and I am delighted that we now have further opportunities for residents to access and understand the local decisions that affect us all. You can register to receive alerts detailing the agenda of the meetings which are available to view online six days in advance. Find out more about our webcasts from our website and join in the debate on Twitter with the hashtag #edinwebcast. 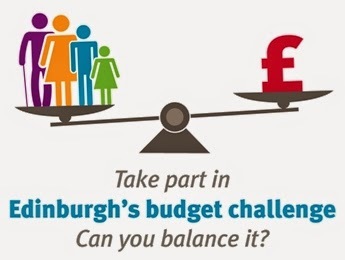 Take part in Edinburgh's budget Challenge! ... well, much more detail is now additionally available via this link; and a budget-planner is also available, for everyone to have their say as to what services they would spend or save resources on? With more than four months to go before the Capital's 2015/16 budget is set, the City of Edinburgh Council has unveiled an innovative online tool to help encourage as many residents as possible to have their say on where money should be invested and saved in 2015/16 and beyond. At a meeting of the Finance & Resources Committee earlier this week (Tuesday 30 September), councillors approved a report on the draft budget, along with a set of budget proposals for public consultation over the coming months. The budget engagement period, which runs until 19 December 2014, begins today [Friday 3 October 2014] and is this year supplemented for the first time by an interactive online budget planner, the first time such a feature has been used by a major city in Scotland. The budget planner, together with a short film on the Council's website and YouTube channel, highlights the range of services the Council provides and the challenges it faces over the coming years in deciding which ones to prioritise against a backdrop of rising demand but flat or reducing resources. Members of the public can take virtual control of the City's finances by using the planner tool to decide how they would balance the budget, discovering how increasing spend in some areas would impact on other areas. 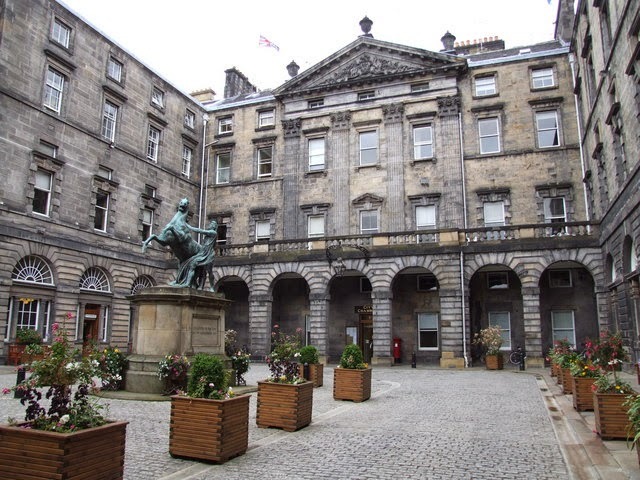 Councillor Alasdair Rankin, Finance Convener, said: “It is very important to us that we hear and respond to what the people of Edinburgh are saying. By publishing our draft budget proposals months in advance of the February deadline it gives the public an opportunity to tell us what services they want their Council to spend more on and to help us to shape them in a way that will improve the lives of all our city’s residents. Councillor Bill Cook , Vice Convener, added: “We want you to be part of this process and we need you to put forward your views whether it is by using our online planner, phone, letter, email, social media, or other means. Everything you say will be considered as part of the budget process and this invaluable feedback will inform the final budget proposals we’ll be putting to the Council in February 2015." The full budget proposals, the budget planner and short film can all be accessed at www.edinburgh.gov.uk/budget. 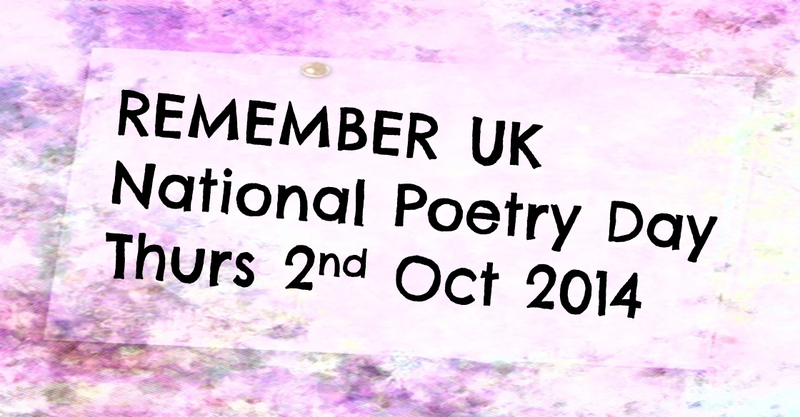 ... and this year's theme is; "Remember".